Standers Security Pole : makes transferring to standing easier, safer. Standers Security Pole makes transferring to standing easier. Easy to install pole makes transferring to standing easier. Can be separated into 2 pieces for easy transport. Height adjustable compact design that's ideal for tight spaces. The Standers Security Pole is an easy to install support pole that makes transferring to a standing position easier. 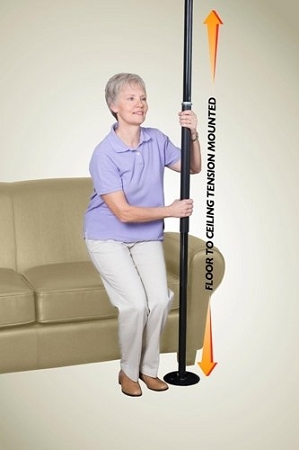 The pole reaches from floor to ceiling and is height adjustable. 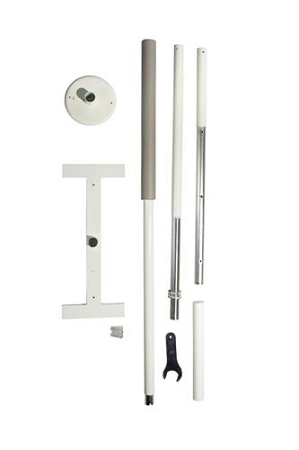 The Standers Security Pole is ideal for fitting in close spaces thanks to its compact design. This pole will not damage ceilings or walls and adjusts from 7 to 10 feet high. It also features a cushion grip that is comfortable, non-slip, and easy to be cleaned. The pole has a weight capacity of 300 pounds, is made of rust resistant zinc plated steel with a powder coat finish, and can be separated into two pieces for easy transport. The Standers Security Pole helps prevent falls to make standing safer and easier for people who have trouble transferring to a standing position. How is it installed? The pole is tension mounted between the floor and the ceiling. It is not necessary to screw into the floor and ceiling, but screws are provided in case the user wants to. What tools are needed for assembly? A wrench is included with each unit and no other tools are needed for assembly. Does it damage the floor or ceiling? Rubber pads are on the bottom and top of the pole to protect the floor and ceiling. What ceiling heights does it accommodate? 7 to 10 ft. ceilings. Pole measures: 84-120 inches long, 12 inches wide, 7 inches deep, 1.5 inch diameter. Fits Ceiling Heights: Range of 7 - 10 feet. Weight of Product: 20.5 lbs. Colors: Metallic Black or Iceberg White. Includes: I-Frame, circular base, main pole piece, top and bottom pole pieces, extension piece, hardware, wrench, assembly instructions.